They Came From Kansas is something you should read. 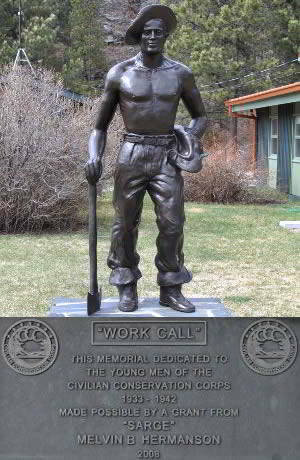 The CCC Museum of South Dakota volunteers have compiled a roster of over 20,000 of the approximately 31,000 men who served in the CCC in the state. This has been an ongoing project for several years. This month (January 2018) while reviewing a copy of a camp newspaper many enrolee's names were discovered and will be added to the roster. 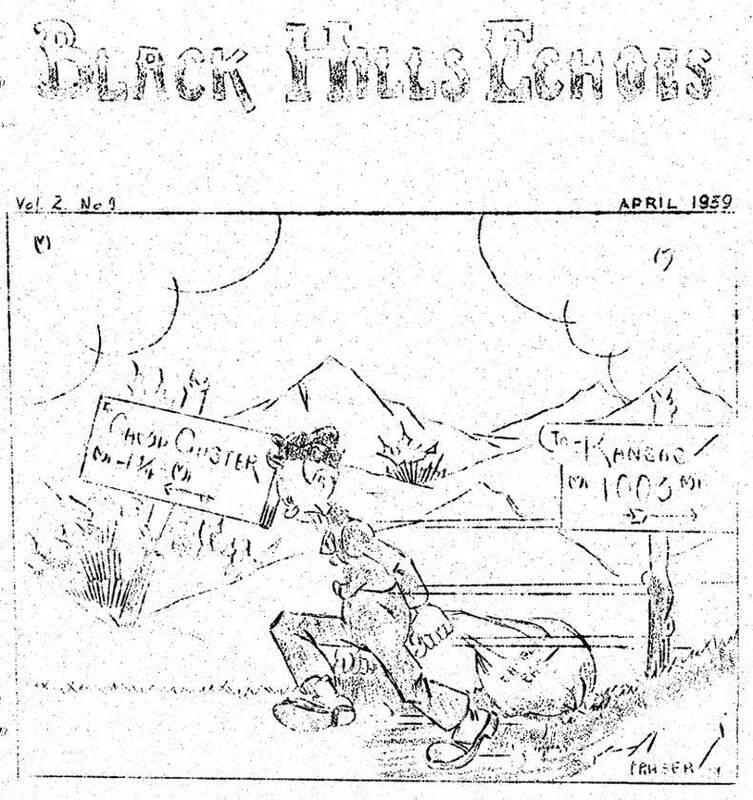 Published monthly by the Journalism Class of Co. 762 CCC. Ninety-three men from Kansas detrained Easter Sunday morning. We of the staff welcome all you new men to Camp Custer and also to the Journalism Class. GOOD LUCK. Company 762 is now located at Camp Custer or Vestal Springs eight miles north and west of Custer, South Dakota. The usual excitement and confusion was order of the two days we moved. Articles were misplaced and just had to be located again. New barracks, larger than the ones at Camp Doran, brought about new barracks buddies and of course each man wanted what he thought to be the best spot for his bunk. Camp Custer was rebuilt last year from barracks moved from abandoned Camp Oreville and Camp Summit. Each barrack is placed so there is plenty of space between it and other buildings. This eliminates a great fire hazard. The barracks are lined with insulation and plywood. The boys were lost a bit at first but as they grow accustomed to the camp layout they will be more than satisfied with the change of camps. Fifty men are now stationed at the Calumet Side Camp. These men, under the direction of Lt. Lonsberry, are busy building the new camp of Sheridan. The camp gets its name from the Calumet Gold Mine. The boys have been doing a little panning themselves, but no millionaires have resulted from their efforts. A news column is expected from the side camp for future issues of the camp paper. From reports there is plenty of news if it is gathered. Let’s hear from you men and get your names in print. The camp composer of songs, near songs and parodies, R. B. Trafford, has composed a new song for the men with traveling feet or lonesome hearts. The title is "The Rocky Road to Custer". That he had plenty of time to compose, decompose and re-arrange verse is evident from these statistics. He states these facts to be true under oath. 10,000,001 stones from 1/2 to 1 inch. 9,999,989 stones from 1 inch to a sprained ankle. 2,345 stones that can't be kicked out of the road. 16 turns and 5 Ys to lead you astray 4.75 miles are uphill. 4.25 miles are downhill. 35% more wear on the right shoe than on the left. 100% of the cars fail to stop and give you a lift. Better progress is made if you walk and not roll downhill. It is a wonderful sight to turn the corner and be in Custer. The most wonderful of all sights on this trip is find the recreation truck parked so you can ride back to camp. Several other of the Camp Romeos want Trafford to compose a song entitled, "How I Miss the Tarvia to Camp Doran". Our genial camp superintendent Mr. L. H. Laird is on leave for two weeks. He plans on getting a well-earned rest. During his absence Foreman Ralph A. Smith is acting Superintendent. Ninety-three men from Kansas detrained Easter Sunday morning.